In a large bowl, mix together the cake and pudding mixes, sour cream, oil, beaten eggs and water. 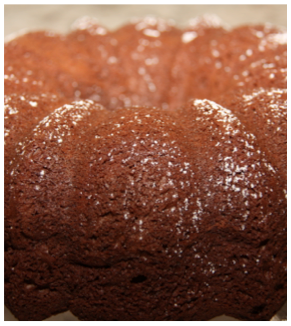 Stir in chocolate chips and pour batter into a well greased 12 cup bundt pan. Bake for 50 to 55 minutes, or until the top is springy and a toothpick comes out clean when pierced through the center of the cake. Cool the cake for at least 30 minutes before inverting onto a plate and sprinkle with powdered sugar. Hubby Rating: 10! He loves this cake! The best part is, it looks quite beautiful sitting on a plate or cake platter...well, anything from a bundt usually does!